Antique pearl and diamond ring from the 1900's. Antique pearl and diamond ring from the 1900’s. Product code: ES3321 Categories: Sold Items, Sold Rings. Antique rings are so individual and here is a very elegant antique pearl and diamond ring in such an attractive design that stands out so well on the finger. 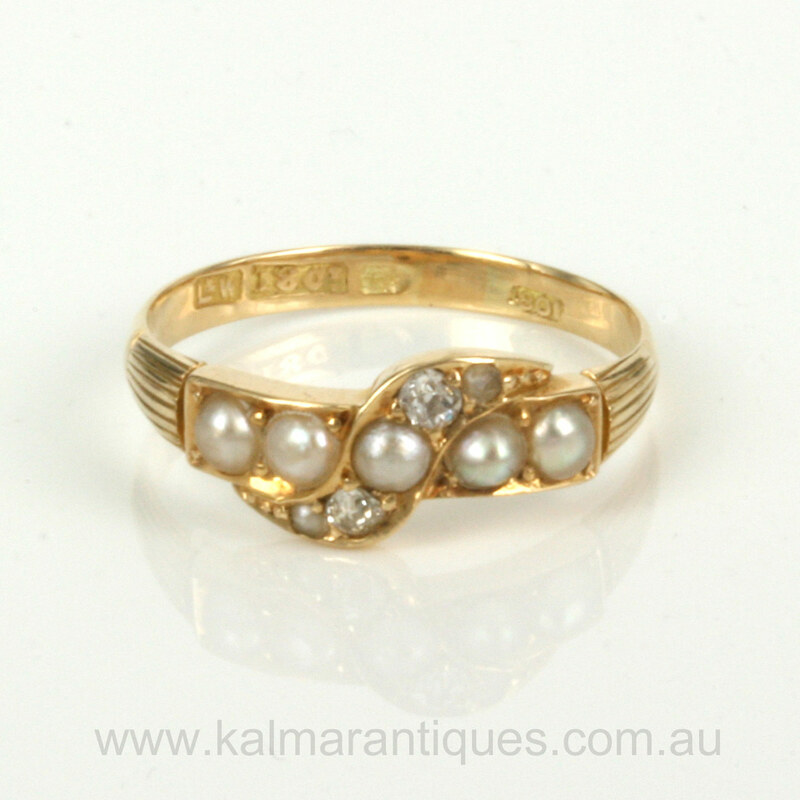 Made in 18ct yellow gold in the Edwardian era of the early 1900’s, this ring is set with 7 pearls and 2 diamonds. Unlike many modern rings, it is not simply a matter of having the diamonds and pearls sit across the ring, rather the ring is set with 5 pearls going across then it has a very lovely twist design set with the 2 other pearls and 2 diamonds to add sparkle. From one pearl at one end to the other, it measures 15mm across by 7.2mm at its widest part in the centre and sits so well on the finger. On each side is an attractive design that adds that extra charm and character and is what makes a hand made antique ring so much more special. This ring is well over 100 years old yet still in superb condition and the design still seems to have a modern contemporary look to it making it so easy to wear all the time. From the cross over design, the combination of pearls and diamonds to the 18ct gold, all go to make this a wonderful and very elegant antique pearl and diamodn ring.